Who doesn’t love Mac DeMarco? His goofy sense of humour, laid-back style and ‘bum-sheik’ dress sense has endeared him to many. When he’s not making comedy films with his mum or sticking drum sticks up his backside, he makes pretty good music with floating melodies and hazy, lo-fi surfaces. But on his new record, This Old Dog, DeMarco pushes all his usual gimmicks aside, showing a rarely seen serious side in a collection of subdued folk-rock songs. While DeMarco’s familiar sonic architecture — warm guitar licks, crooning melodies and swaggering rhythms — is still prevalent, This Old Dog is a stripped and intimate interlude in DeMarco’s canon which sees him at his most vulnerable and contemplative. Delivered through a breeze of gusty guitar and analogue Casio keyboard, the compositions on This Old Dog are stripped down to the bare bones, exposing a vulnerability to DeMarco that has seldom been seen in his work. 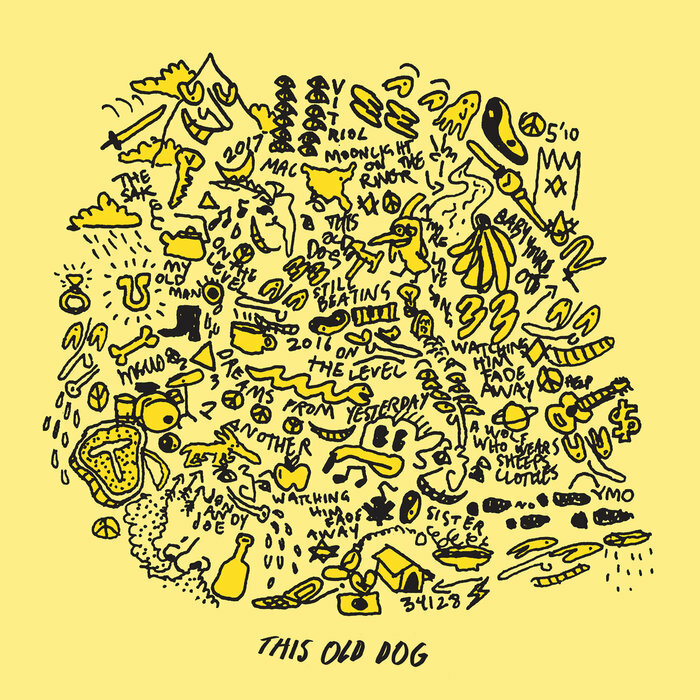 Title track ‘This Old Dog,’ with its hushed guitar and breathy drums, follows the same delicate pattern. The track is essentially a break-up song, in which DeMarco softly croons the lyrics with more than a whiff of nostalgia: “This old dog ain’t about to forget / All we’ve had / And all that’s next.” It’s melodic and gentle, and subtly hints at a few open wounds DeMarco may still be licking. This evocative atmosphere continues with ‘A Wolf Who Wears Sheeps’ Clothes,’ which boasts an old-school, American-folk twang, as DeMarco’s rusty voice bounces off the pastoral hymns of harmonica and acoustic guitar. Again, the instrumentation is compact and compressed; it’s difficult to imagine DeMarco lolloping around stage in his customary manner to the slow, woozy music he’s turned to on his new record, but it works nevertheless. Lyrically, there is a wealth of poignant, personal songs on the album, with many that revisit moments in DeMarco’s past. ‘Sister’ quietly hints at loss – or something as equally painful — as DeMarco sings “Turns out not every dog has his day / So sad, so suddenly gone away.” At just one minute and 18 seconds, the track is over nearly as quickly as it begins, and offers a fleeting visit into the deepest, saddest parts of DeMarco’s memory. Likewise, one of the most striking moments comes with ‘Dreams Of Yesterday,’ a beautiful, sleepy number; sparse and quiet, the track is reminiscent of John Lennon circa Plastic Ono, as DeMarco’s cynicism creeps through (“Once a dream is finally put to bed / Rest up sleepy head / Might as well be dead”). Notwithstanding these moments of quiet reflection, there are signpost ‘DeMarco moments’ evident in This Old Dog. ‘Moonlight On The River’ uses slow, glistening synths to get a grip on its listener, before descending into a conclave of sharp, The War On Drugs-style guitars. But yet again, DeMarco’s lyrics are blunt and to the point, as he mulls over the inevitability of mortality: “There’s moonlight on the river / everybody dies”. But DeMarco hasn’t completely discarded the free-loving vibes that have made him such an enjoyable musician. ‘One Another’ is a bright, blossoming guitar number, in which DeMarco tries to put things into perspective, singing “It’s not like you never tried to forget her / But these days are better without one another” over a bluesy chorus. Whichever way the mood-pendulum swings, it is clear that there is a tangible mass to This Old Dog, a quality that has arguably gone amiss in his otherwise unsullied songwriting in the past. By shaving down his song writing, DeMarco has managed to make his quirky, old-school style stretch further; the music is softer, and places greater weight on DeMarco’s emotional state. Despite its slower, bluer tones, it would be naïve to think of This Old Dog as a sign that DeMarco is slowing down. Rather, it is a sign that he has learned that in order to move forward, he must first look back. The grounding reality of the record is that, for the first time, we have seen DeMarco rear his serious side: no jokes, no gimmicks, and no drum stick disappearing acts: just soulful, laid-back and sombre sleeper-rock songs that are thoughtfully written and eloquently delivered. This Old Dog is irrefutably DeMarco’s most personal and deeply intimate album to date, in which he looks unflinchingly at his past with a wry, gap-toothed smile.